It was everywhere. On social media, everyone seemed to be trying this donutella. I saw one ‘friend’ mention she’d gotten it from a local milkbar. Then I saw a few more things pop up on my news feed, an article in the local paper wrote about it, and even discovered that the news had featured it! 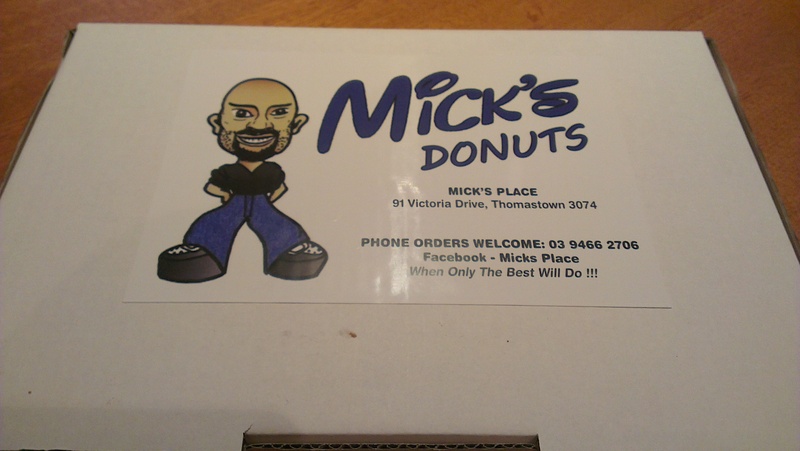 Apparently, Mick’s Place in Thomastown had been selling this thing for ages, and only recently had it exploded on social media, making people travel great distances from all over the state, line up in front of the store, even attracting interest from celebrities, no less! It was everywhere. It still is. Lots of memories here. And even though these were new owners, this was the same location, the same milkbar, though the name was different and there was a new paint job out front and there were now tables and chairs for those sitting down with a coffee to watch the cars drive past. If this were true, and the doughnuts were that good… wow. Mick’s Place putting Thomastown on the map? Everyone flocking to our old turf, everyone raving about the doughnuts sold there? That was something this former Thomo girl would be immensely proud of. It was perfect timing too. I had been on a bit of a doughnut mission before commencing my Winter leave, and after my work buddie discovered that the place we were both hanging to explore, Big Lou’s on Brunswick street, also famous for their doughnuts, were temporarily closed and in the process of moving (that was such a sad discovery) I didn’t know where I would get my doughnut fix from. Until Mick happened. I don’t even like Nutella that much. But I had to try these. The shop is full. It’s like a bank on pension day. He later told me that the line had spiralled around the shop. Everyone was there, solely for the donutellas. He said he felt sorry for anyone stopping to buy smokes, or milk. You wouldn’t want to wait past all the doughnut-ravaging people. He couldn’t bloody believe it. Neither did I. I made him re-tell several parts of his story bit by bit. “And this is the milkbar I used to hang out at? Corner Vic Drive and Carrington?” I was still in disbelief. He said it was crazy like the ‘Flaming Moe’s’ fad from that popular Simpsons episode. Everyone was going there, everyone wanted one, and it was making the people mad. A little place, turned into a sensation, just because of a simple variation on a regular food item. Nothing extraordinary. Just Nutella on a doughnut. Hubbie wasn’t even asked how many he wanted. He was given a box of 6 for $18. $3 a doughnut. For a considerably sized doughnut too, I might add. This was more a bombolone, a type of doughnut without your typical hole in the middle, replaced instead with the Nutella in the middle of the dough with a bit on top. 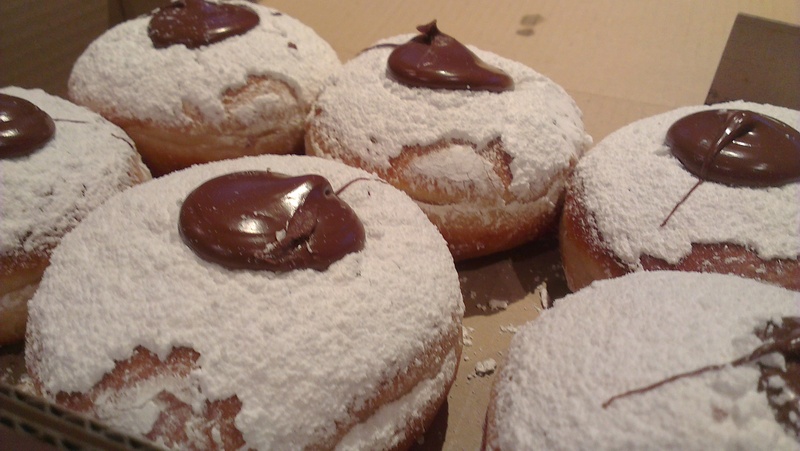 The dough was deliciously soft and fluffy, like a cloud if you could eat them, so very tasty and moorish, and with the addition of Nutella in the middle – oh my goodness, as I’m constantly saying to baby girl. And like I said, I don’t even like Nutella that much. This was awesome. 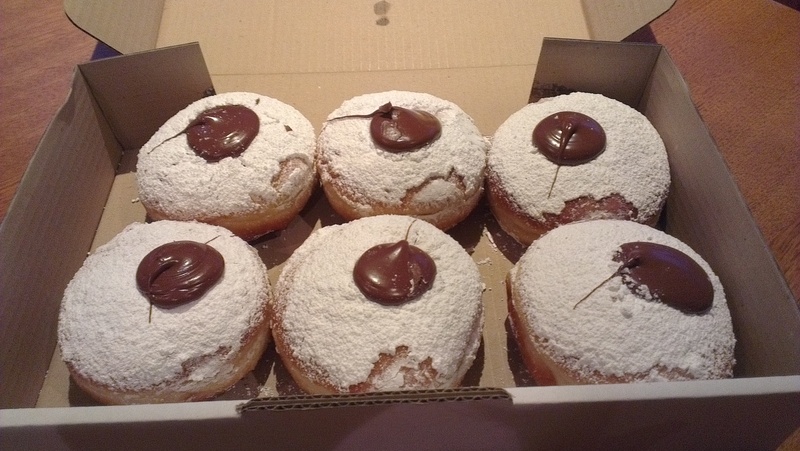 I had read somewhere that Mick had conferred with the baker of the doughnuts until they had created the perfect combination of dough and Nutella, coinciding with the creation that flocks of people were now travelling to experience. The doughnut is a generous size, and you will feel full afterwards. Sweet tooths will love the Nutella, and even if you’re not crazed over the hazelnut chocolate spread like me, I think you will like it. Even Hubbie said it was nothing amazing, and then after the taste lingered in his mouth said “no, it’s good. It is good,” with a smile creeping up onto his face. They’ve gotten the combination perfecto. Right now it is a craze, but I hope that Mick’s Place ride this wave as long as they can and utilise the opportunity, turning it into an ongoing thing, rather than a momentary sensation. The doughnuts are worth it, worth the travel and worth the queue, and happily, they fixed my temporary craving for doughnuts. You get swept up in the donutella-mania really easily. We stopped by the milkbar once over this last weekend, and I’ll be headed in tomorrow to drop in with baby girl. There was a 6 per person limit when I went in. I’m considering ordering a massive stash for baby girl’s upcoming birthday, but we’ll see. My temporary craving has been replaced by a long-term addiction – this donutella is serious stuff. So beware. Not only will eating a dountella make you want more of this soft and fluffy Nutella doughy-goodness, but you will be sucked into the craze, and it’s a train that’s not stopping anytime soon.